MOSCOW -- Russia's coast guard opened fire on and seized three of Ukraine's vessels Sunday, wounding two crew members, after a tense standoff in the Black Sea near the Crimean Peninsula, the Ukrainian navy said. The FSB confirmed early Monday that it fired on the vessels to force them to stop, and then seized them. Russia claims the Ukrainian vessels were violating it's territorial waters. As CBS News correspondent Elizabeth Palmer reports, the facts of the matter remain unclear, but the U.S. appears to be agreeing with the Ukrainians. U.S. government special envoy on Ukraine Kurt Volker tweeted early Monday that Russia had rammed the Ukrainian tugboat as it was "peacefully travelling toward port...and then accuses Ukraine of provocation????" An emergency meeting of the United Nations Security Council was called for Monday morning over the escalating situation, which would be attended by outgoing U.S. Ambassador Nikki Haley. CBS News' Pamela Falk said the emergency meeting was called by the Russian Mission to the U.N.'s Deputy Ambassador Dmitry Polyanskiy. He said he had called the meeting, "to discuss dangerous Ukraine provocations in the sea of Azov and Kerch Strait near Crimea threatening international peace and security." Ukraine's Ambassador to the global body, Volodymyr Yelchenko, fired back in a tweet, however, referring to "the audacious behavior of the aggressor," which he said could only be addressed "by joint coordinated efforts." 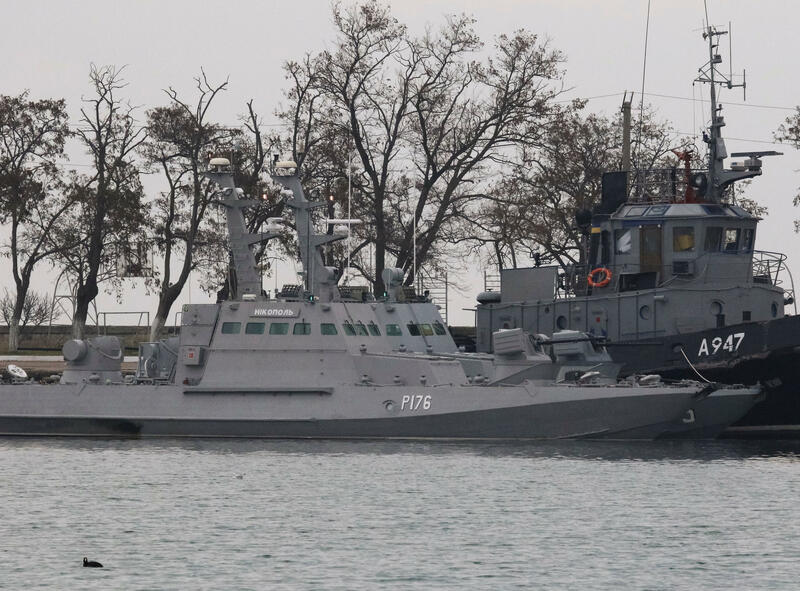 The tugboat which was rammed was traveling with the two Ukrainian gunboats from Odessa on the Black Sea to Mariupol, an eastern Ukraine port, via the Kerch Strait. Ukraine's Interior Minister Arsen Avakov posted a video to Twitter on Sunday which was apparently shot from inside the Russian vessel as it rammed the Ukrainian tug. Avakov did not reveal how the Interior Ministry obtained the video, but in it a Russian officer can be heard giving orders to his crew to continue steaming toward the much smaller vessel to force it off course. After the impact with the tug he orders his crew to stop their own vessel. Avakov called the 1 minute and 15 second video proof of Russian "aggression" and said he was looking forward to receiving support from Ukraine's allies in response. The Kerch Strait is the only passage into the Sea of Azov. The strait is spanned by the recently completed and highly symbolic Kerch Bridge, connecting Crimea to Russia. Transit under the bridge has been blocked by a tanker ship, and dozens of cargo ships awaiting passage are stuck. Ukraine blames Russia, Russia blames Ukraine and U.S.
Ukrainian President Petro Poroshenko, after a meeting with his National Security Council, said in a statement he would ask parliament Monday to take up the issue of whether to implement martial law over the incident. Palmer notes that under martial law, Poroshenko would be able to more quickly mobilize his own military for an escalation with Russia. Many of his opponents, however, point to the fact that he is also calling for martial law -- for the first time during years of tension with Russia -- about a month before campaigning is due to begin for presidential elections in March. An official declaration of marital law would force the campaigning, and possibly the election, to be delayed.